Microtia literally means ‘small ear’. 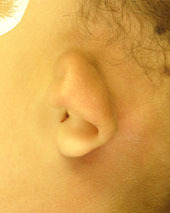 There are many forms of Microtia with different sizes and shapes of ear remnant being possible. Often there will be no ear canal, this is known as atresia of the canal and the combination of the two conditions is known as “Microtia with Atresia”. In New Zealand we have a relatively high incidence of this condition with about ten new cases being born each year. We still don’t know exactly what causes Microtia but we know that during development of the embryo there is a change in the development of the embryonic facial processes. Sometimes this is manifest in other associated anomalies of the face such as a small jaw, palsy of parts or all of the facial nerve, cleft palate etc. The combination of these is sometimes called Craniofacial Microsomia. Some children have a specific collection of problems that fit a recognised pattern called a syndrome. 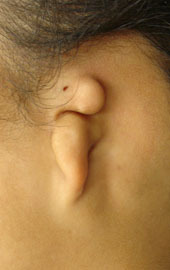 Examples of syndromes that may include Microtia include Treacher-Collins, Nager, Goldenhaar. Some syndromes may have a genetic inherited component. For the majority of cases there is no genetic component and the cause is unknown. Many parents are worried that they may have done something wrong during pregnancy, but this is usually not the case. For the baby and young child no specific treatment is required for the affected side but it is important to check that the normal side has adequate hearing. Management of ear infections is important. Occassionally a drainage tube or ‘Grommet’ is required in the preschool years. A consultation with a Pediatric Otologist is appropriate to give advice on potential for hearing aids. It is advisable to use hearing aids from an early age to allow development of the auditory cortex in the brain. There are several options for very sophisticated implanted hearing aids which give very good hearing in the affected ear. This can be discussed with a Paediatric Otologist. the inner ear is present but the ear canal and small bones within the ear are malformed or missing. In some children the small bones may be good enough to allow an ear canal to be created by an Otologist. Normally this is not performed until an external ear has been created so may not be until the early teenage years. A scan near that time will help to determine if this is possible. -what the remnant ear looks like, where the remnant is positioned on the face in comparison to the other side, how low the hairline is, whether there are one or two ears to be made, and the preference of the family and the surgeon. In general terms there are two methods: Using a cartilage framework and native scalp skin, and using a Medpore framework covered with fascia and a skin graft. In some cases it is appropriate to use a cartilage framework covered in fascia and skin graft. Of course none of these methods restore hearing. Their purpose is to build an external ear or ‘pinna’. This list helps to differentiate between the methods of ear construction.